Now let me tell you about Randy Kottke, The Rambler. I could tell you about seeing this guy after the 2017 race in a red Hare Krishna-type robe, flitting around the campground playing a flute or fife, circling groups of people, handing them pocketfuls of laughter and moving on. I was stuck to my chair, wondering if what I was seeing was real or if the hallucinations were still tapping at me. I couldn’t stop laughing, watching the jester do his thing, spreading his love and infectious glee to family and strangers alike. 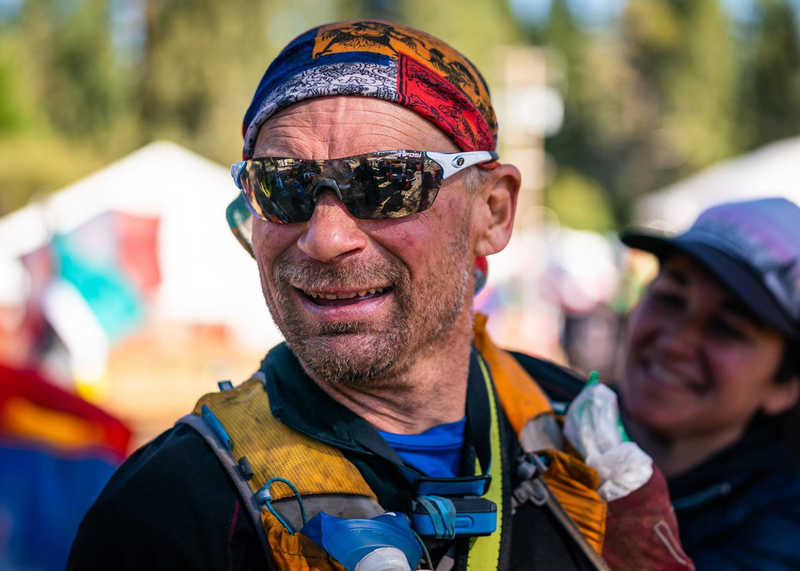 Or maybe I should tell you how, once the 17-miler was cancelled last year due to a wicked mid-April blizzard, Randy decided to find a 100-mile runner to help, so Randy—a finisher of Moab 240, Tahoe 200, Arrowhead 135—surprised Matt McCarty and paced him for a loop in the worst of that epic storm. “Running across the field I could see Randy dressed and ready to go with his smile,” Matt says. “The next five hours flew by. There wasn’t a silent moment. Randy brought out the best in everyone. We talked about life and priorities as it pertained to relationships with people we love, family and our children. We spoke with everyone we encountered along the way and shared a lot of Rambler belly laughs. I’ll never forget it.” Randy ran every Zumbro 17-mile race. And every year he volunteered Thursday and Friday before the race. Although Randy lost his battle with cancer and left us a few months ago, he’s still on the list for this year’s race, bib number 1955. These things are important. These people showed up, became family, explored their limitations and boundaries, did things they weren’t supposed to do and helped others do the same and shared laughter and friendship along the journey. These people are Zumbro. Race starts Friday, April 12th, 8 am. 121 registered runners, 98 males (81%) and 23 females (19%), from 17 states and 3 countries. The youngest runner is 23 (Leif Hanson) and the oldest is 66 (Gary Dudney), with an average age of 41. 23 runners (21%) have one or more finishes and 84 (79%) have zero finishes or it’s their first attempt. Six loops. 34 hour time limit. Scott Coles won last year, and though he is only ranked 9th on Ultrasignup, he finished and won this race in an epic weather year, which means he has something special inside him. 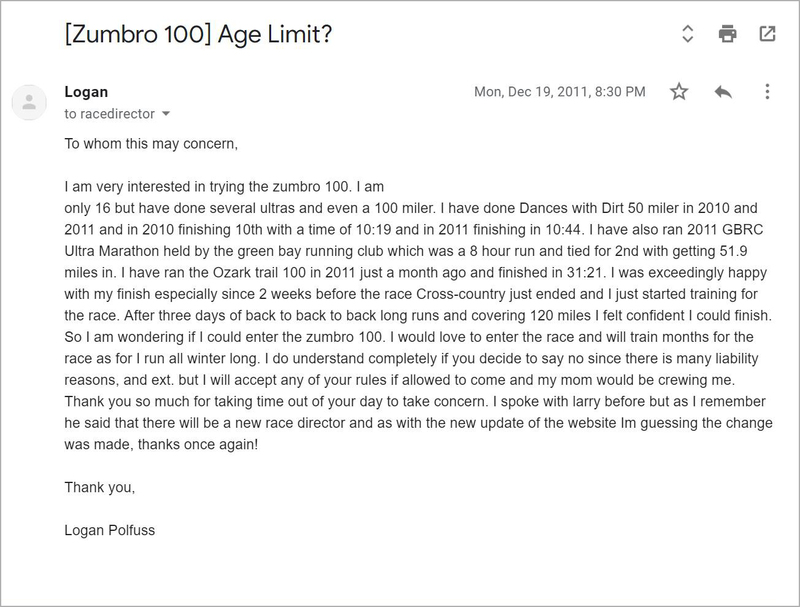 Grand Master runner Doug Kleemeier won the 100 in 2015 and 2017 (with the third fastest time ever run in the 100 at the age of 50) BUT just declared he is not running and instead is volunteering – that is the Zumbro spirit. Mike Ward previously held the fastest known time on the Superior Hiking Trail, and he has a couple second place finishes in the Zumbro 50 and is a steady machine – his times in the Zumbro 50 account for the 3rd and 6th fastest times ever run at that Zumbro distance. Jacob Gallagher won the 50 last year, and I hear he’s been training well with some local speedsters in our shared hometown of Mankato. Timothy Adamski has some solid performances and he ran the Black Hills 100 last year in denim overalls, which takes grit. While Lindsay Henkels has limited trail running experience, she ran the third fastest women’s time ever in the Zumbro 50 in 2016, which was her first trail race, and she brings quite a road running pedigree (side note: if Lindsay and Jake Gallagher each win the 100 and bring these titles to Mankato where they both live, the streets of Mankato will look like a Super Bowl riot with mobs of wild trail runners flipping cars and tearing down light posts, once said mob sufficiently recovers from Zumbro). Faye Norby is coming off wins at Tuscobia 160, Arrowhead 135 and Actif Epica —she will do well and if the conditions are rotten she could completely dominate everything, though it’s also possible she dominates in lovely conditions. Colleen MacDonald will run strong—she is a very tough runner and has placed second in the 50 here and is very capable of winning this. Last year’s winner, Angela Freedman, is returning, and leads a strong pack of masters runners that includes Tammy Davis, Erika Lohn, Colleen Jay, and Laurel Sipe. Susan Donnelly is attempting her 10th finish. Daryl Saari is going for his 9th finish and Erik Raivo is going for his 5th finish. 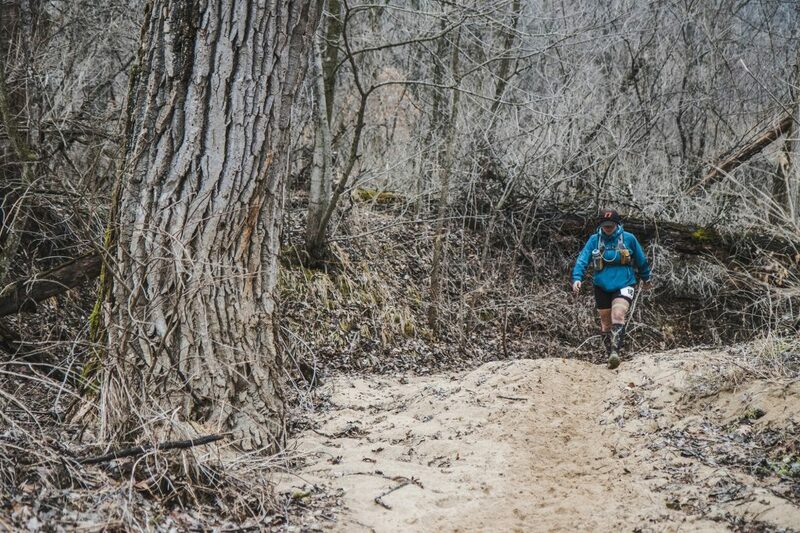 The Zumbro 100 Mile Endurance Run is the first race in the Upper Midwest Trail Runners Gnarly Bandit Ultra Series. The series consists of 5 ultramarathon trail races; Zumbro 100 Mile, Kettle 100 Mile, Black Hills 100 Mile, Superior 100 Mile and Wild Duluth 100KM. Those who have entered the series with UMTR and have registered for Zumbro are Timothy Adamski, Tammy Davis, Josh Harris, Jimmy Jones, Erika Lohn, Radek Lopusnik, Faye Norby, Erik Raivo, Neil Runions, Daryl Saari, Joel Toews, Ryan Wanless, Paul Wilken. Others have signed up for the series with UMTR but have not yet signed up for Zumbro (hint: if you’re one of those you need to register for Zumbro). Good luck Gnarlies! 100 mile runners will be wearing pink ribbons as a sign of their foolishness. If you’re running other races, please understand that the pink ribbons mean it may be difficult for us to get out of your way if you’re speeding by, or that we may be stuck in a hallucination or some other dimension, so please forgive our smells, our bad jokes that only we may understand, and our inability to move aside quickly. Race starts Friday, April 12th at midnight (late Friday/early Saturday, depending on how many jokes John Storkamp has up his sleeve before sending runners off). 3 loops. 18 hour time limit. 275 registered runners, 178 (65%) males, 97 (35%) females, representing 10 states and 2 countries. Youngest runners are 21 (Janet Eiynck, Tyler Kobilarcsik, and Michael Palo) and the oldest is 70 (Mark Stodghill), with 41 being the average age. 66 runners (24%) have one or more finishes while 209 (76%) have zero finishes or it’s their first attempt. This women’s field is incredibly deep and should prove to be one of the most competitive races the Midwest will see this year. Lisa Dunnigan is never out of the top 5 at the races she runs. Gretchen Metsa has won the Hitchcock 100, Wild Duluth 100K, Zumbro 50 (2018), Superior 100 and Curnow. Emily Wanless won Superior 50 last year (2018) and won Zumbro 50 (2017) and has several other race wins. Leslie Semler is one of, if not the most, experienced women in this competitive field, having been running trails and ultras much longer than the aforementioned. Mallory Richard is the four-time winner of the Superior 100 and holds the course record there, has won the Black Hills 100 outright, has represented Canada at the World Trail Championships, and her list of wins at other races is a long one—this is her debut at Zumbro. Pitter patter. The men’s race has some good speed but not a lot of Zumbro experience. Nate Canton placed third at the 100 in 2018. Lance Cundy has some solid performances. Mark Emmons hasn’t run Zumbro but has done well at Superior, Voyageur, and Wild Duluth. 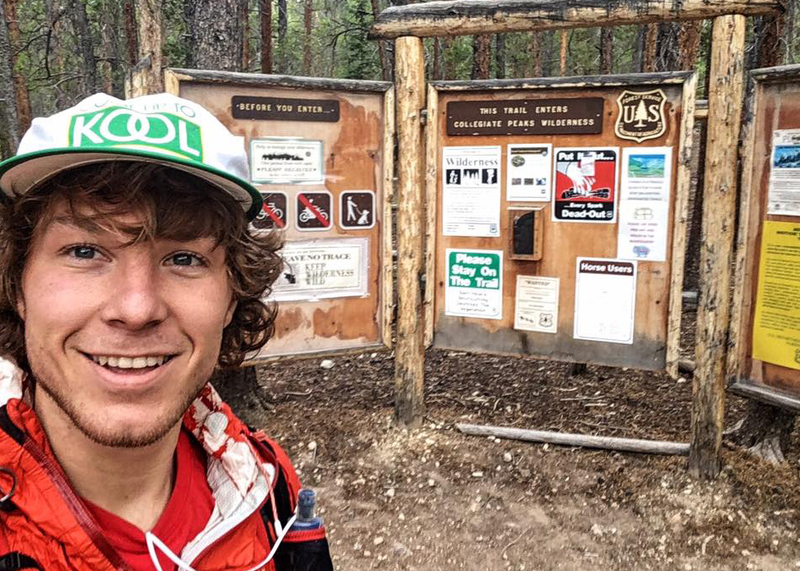 David Hansen has good Zumbro experience and does well at the 50-mile distance. Still, I wouldn’t be surprised to see one of those ladies take the entire field. At the age of 70, Mark Stodghill of Duluth, MN is the oldest person running the Zumbro 50 and is tied as the 2nd oldest person running any of the distances this year. Mark has one of the highest all-time totals of marathon and ultra finishes of anyone from the state of Minnesota, with more than 425 finishes. Scott Rassbach (race founder Larry Pederson’s nephew and volunteer race MD at the Afton Trail Run) is going for his 6th finish. Tim Sieh is going for his 6th finish. Travis Thiede is going for his 5th finish. 50 mile runners will be wearing blue ribbons for similar reasons as listed for the 100 milers! Race starts Saturday, April 13, 9 am. One loop. Nine hour limit. 530 registered runners, 234 (44%) male and 296 (56%) female, representing 10 states and 2 countries. The youngest runner is 9 years old (Becca Hadtrath) – running with Dad Eric who is usually behind the camera at Zumbro, and the oldest is 72 (Leonard Alcamo) with an average age of 42. One or more finishes 153 (29%), and zero finishes or first attempt 377 (71%). The men’s field is speedy. Like speeding ticket speedy. In 2017 Mike Ferguson ran a 1:56:39 for the win and course record—he’s been itching to get back and defend his title and record – he also holds the 2nd fastest time ever run on the course from his 2016 win and is the only person to ever record times under 2 hours on the course. He is an accomplished obstacle course racer who is planning to spend even more time racing trails in 2019. Chase Nowak is making his Zumbro debut. Chase has occasionally placed second at his races, but most often he wins those he starts. Mike Borst’s debut at Zumbro was in the 50-mile back in 2013 as he and Trail Transformation coaching partner Jake Hegge ran stride for stride, setting a new course record—since that time Kurt Keiser (also in the 17 this year) crushed that record (which still stands) while Borst went on to set the 100-mile course record, which also still stands. Given his pedigree (sub-2:20 marathon, Olympics trials, you get the point) when Kurt Keiser toes the line of a trail race, there are few in the Master’s division that can challenge him… well, not this year as Olivier Vrambout has been on a tear the last couple of years, running just a minute and a half faster than Keiser for the Master’s title at last years Afton Trail Run 25K. Nathan Swenson’s UltraSignup is dotted with 1’s and 2’s and should figure into the overall standings. This field could end up running the legs off each other, so it’s a good thing they’re sticking to one loop. In the women’s race, Molly Pennings has done well here in the past, with a win in the 50 in 2015 and a third place finish in the 17 in 2016. Barbara Swenson brings a long list of wins and high placing finishes. Margeret Ho has a limited amount of racing but her finishes have been high in competitive fields (second places at Voyageur and Dances with Dirt), and Heather O’Donnell and Laura Edmund Miller also have similar resumes, with limited but fast experience. Steph Hoff is running the 17-mile with daughter Ava (12 years old) and son Grant (14 years old). Steph is a two time Zumbro 100 finisher (2015 placing 2nd woman and10th overall and 2018 placing 3rd woman and 12th overall). Ava is the youngest all-time finisher of the 17-miler as she finished in 2017 at the age of 10. This is Grant’s first Zumbro! The entire family volunteers at Rocksteady Running races and volunteers on trails. Rose Biancini, John Eiden, Travis McCathie, Lonna Simanovski, Steve Smillie, Dan Valentine are all looking for their 6th finish in the 17-mile race. Randy Kottke was signed up and would have been going for his 6th as well. Chris Anderson, Charlie Flynn, Steven Heim, Jessica Johnson, Ann Noser are all looking for their 5th finish in the 17-mile race. Like all Rocksteady races, you’ll find the best group of volunteers here. Some are racing too. Some will sleep less than most runners. Some have run more loops of this course than they can count, even with their socks off. Some have never run at all. Your success is their success, and your safety is their safety. Zumbro is a community, a family, a gathering of the tribe after the long winter. Each runner’s success belongs to all of us. No one does this alone. Volunteers, you are incredible people with amazing energy. Many thanks. May you have a blast out there. So let’s talk about the weather. Just kidding. It’s Zumbro. It’s Minnesota in early April. The weather will change day to day, even loop to loop. The course conditions will change—you’ll most likely find some mud, a bit of sand, maybe rain, snow, hail, and the hills may grow taller and steeper each loop. Please go through the trail conditions instead of trying to find your way around them. It’s a unique and challenging landscape, one that many runners underestimate. Let’s go play in the woods. Let’s explore our boundaries and expand our ideas of what we’re capable of. Let’s prepare ourselves for unpredictability. Let’s pause to listen for the sound of sandhill cranes, and coyotes and owls at night, and spring robins and finches with the sunrise. Let’s not take ourselves too seriously—we are simply running circles in the forest. Let’s find gratitude with each turn of trail and help each other along the way. Let’s make some new friends to share trail with and find old friends to hug. Let’s go do Zumbro y’all.